MANILA, Philippines - A few months ago, Iah Seraspi, the poor fisherman’s daughter from Romblon who topped the 2015 Board Exam for Secondary School Teachers, moved netizens with her message on poverty. Now, the recent topnotcher of the Licensure Exam for Teachers (LET) has an equally amazing story to tell. 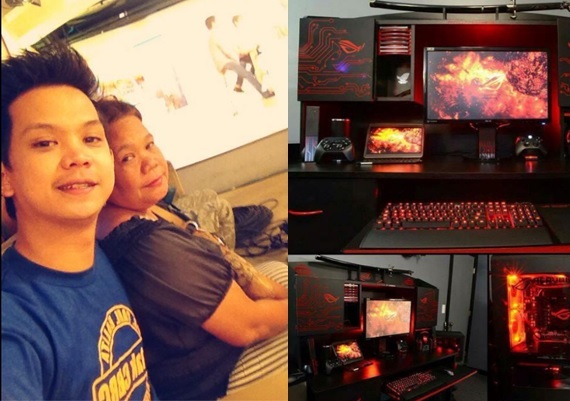 March 2016 LET topnotcher and former online game addict Michael Prince del Rosario with his mother. Michael Prince del Rosario, the topnotcher of the latest LET in the secondary level, wasn’t exactly a model student back in high school. Lorma College's Michael Prince del Rosario tops LET. In fact, his addiction with an online game forced him to drop out of school. "Hindi na po talaga ako pumapasok, sobrang lala po ng ka-addict-an to the point na wala na po. Nag-drop-out ako tapos ang masama pa niyan hindi ko kayang sabihin kina Mama, tinago ko po muna,” del Rosario revealed in an interview with DZMM. When he was in his supposed-to-be senior year, Rosario had an important realization after seeing his batchmates getting ready for graduation and planning for college. It was at that moment that Rosario had an awakening. "Unti-unti ko na pong nakikita na pa-graduate na po 'yung mga ka-batch ko, na ang ganda-ganda na ng plano nilang mag-college, na ang sarap ng mga dreams nila for their family. Sa isip ko, pa'no ako? Pa'no ko ibibigay 'yun sa family ko?” Rosario said. Through the Department of Education’s (DepEd) Alternative Learning System program, del Rosario was given the opportunity to get a high school diploma. This involved reviewing a module in order to pass an exam to get a diploma that would make him eligible to enter college. Aside from garnering a score of 92% in the recent LET, del Rosario previously landed the eight spot in the 2010 Nursing Licensure Examination. However, del Rosario chose to teach in a review centre instead of working as a nurse since he feels that he is not yet prepared to take responsibility for someone’s life. Currently, del Rosario intends to teach a science subject in public provincial secondary school to uplift students with his incredible story. Watch del Rosario’s interview in Umagang kay Ganda.